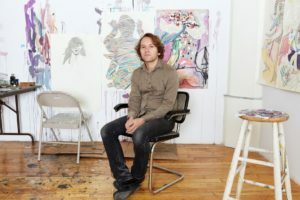 Austin English lives and works in Brooklyn and Stockholm. He works with drawing, painting and comics. His published books include Christina and Charles, The Disgusting Room and the series Windy Corner Magazine (which he also edited) from Sparkplug Books. He recently completed the book The Life Problem, which was published by Drippybone Books. His illustration work can be seen in many publications, including The New York Times. He also runs the publishing house Domino Books.